We will upload this koi’s video on the site soon, please check back for more details. 6 years old 90cm ※This koi is from the same parent set as Lion Queen, but is one year younger. 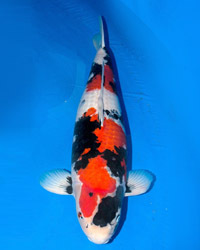 We will have our second auction of the Autumn on November 19th here at Momotaro Koi Farm. The auction will start at 10:00 a.m. This auction will feature high class tosai as well as other tosai, 2,000 in total. We will also auction off 20 special high class nisai with a start price of 1,000,000yen and above. We will have the pictures of the auction nisai on the website soon, please continue to check back for more updates and information. As always, this is dealer auction. 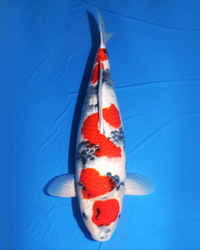 Hobbiests should contact Momotaro Koi dealers for bidding information, please see the agents page for contact information of our dealers. Please contact us for bidding information. We can bid on your behalf.